Each changing season brings new hiring challenges to human resources. You may think the headache of seasonal hiring is behind you with summer underway. But fall and winter will be here sooner than you think. 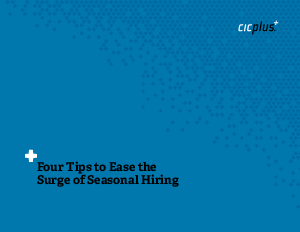 In this free e-book, “Four Tips to Ease the Surge of Seasonal Hiring,” you’ll learn more about these four key elements to successful temporary hiring.